VMFA's Gordon Parks Exhibit Explores an Important 20th Century Black Photographer | Arts and Culture | Style Weekly - Richmond, VA local news, arts, and events. The Gordon Parks Foundation/VMFA This image shows everyday life for African-Americans in St. Louis, Missouri, in 1950, shot by former Life magazine photographer Gordon Parks. 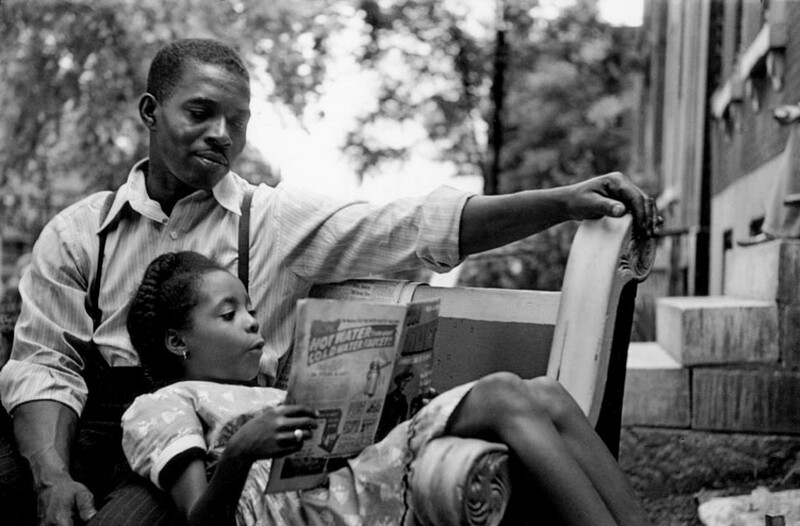 A young girl reads a newspaper while leaning up against an older man — presumably her father or an older brother — in a dress shirt and suspenders. A family relaxes on the front porch. The father reclines while he smokes a pipe, the seated toddler mirrors his daddy while the mother works on her sewing. All are blacks living in St. Louis, Missouri, Columbus, Ohio, Chicago, and Fort Scott, Kansas. They posed for the 20th-century African-American photographer, Gordon Parks, in 1950. Parks, who worked for Life magazine as the only black photographer from 1948 to the late 1960s, took these and another 38 gelatin-silver photographs for an assignment he completed that was never published. In the photographs and accompanying essay, Parks traced the lives of his childhood classmates from Fort Scott, who all attended the same segregated elementary school. A mostly self-taught photographer, Parks left his hometown shortly after his mother died and before he completed high school. The Life magazine assignment marked Parks’ first return to Fort Scott as well as his first writing opportunity. Although he originally intended to trace the stories of his classmates in the town, he discovered that many of them had moved to larger cities. 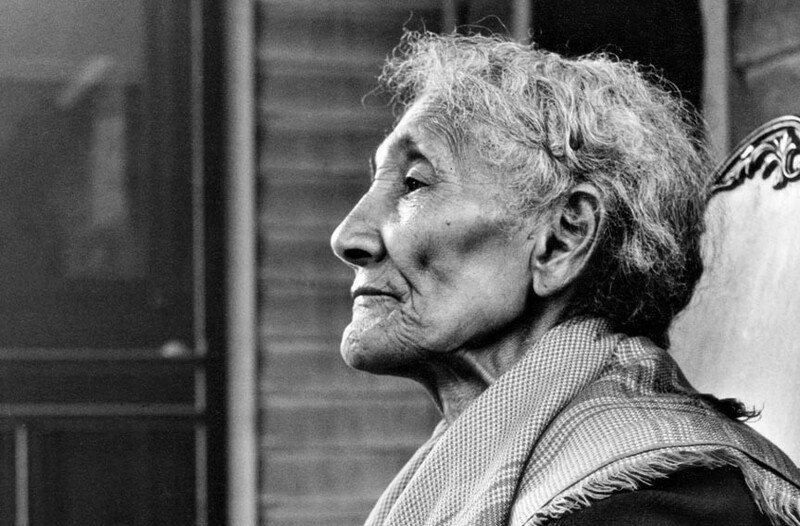 “In the Fort Scott photographs, Parks digs deep into the lives of his former classmates. He is unafraid to show the good and the bad,” says an associate professor of history at the University of Virginia, John Edwin Mason, who’s writing a book on Parks. Gordon Parks died in 2006. Here is his photograph of Mrs. Jefferson in Fort Scott, Kansas. These photographs of Parks’ childhood friends will be on view at the Virginia Museum of Fine Arts in the traveling exhibition “Gordon Parks: Back to Fort Scott,” from July 23 to Oct. 30. In contrast to earlier iterations of the exhibition elsewhere, the museum has added “Parks at Life: Works from VMFA’s Collection,” which offers eight additional photographs by Parks alongside copies of the corresponding Life magazine essay. Sarah Eckhardt, the museum’s associate curator of modern and contemporary art, started acquiring Parks’ photographs for the museum in 2012. “When I came to the museum, I wanted to build a civil rights collection, since we did not have one,” she says, noting that she bought the museum’s first Gordon Parks photograph, “Department Store, Mobile Alabama” (1956) in 2012. While Parks has been hailed as a photographer and filmmaker — and the museum will screen three of his films — his ability as a writer is less recognized. For Eckhardt, having copies of the Life magazine articles is essential because they display the photographs within their original context. As such, Parks offered his readers a firsthand look at the changing black identity in the 1950s and ’60s by focusing on such topics as family dynamics, juvenile delinquency in Harlem, the black power movement and the Nation of Islam. “Gordon Parks: Back to Fort Scott” opens at the Virginia Museum of Fine Arts on July 23 and runs through Oct. 30. For a complete list of related programs, see vmfa.museum.